History can be a difficult subject to teach your children. It’s really easy to get bogged down in the places and names and dates. But when you do that, no one has any fun – not your children, and not you. Amy Pak of Home School in the Woods knows that, and she also knows how important history is to help us (and our children) understand the world around them. She’s created a whole company around helping parents teach their children all those important names and dates in fun ways – ways that they’ll remember. 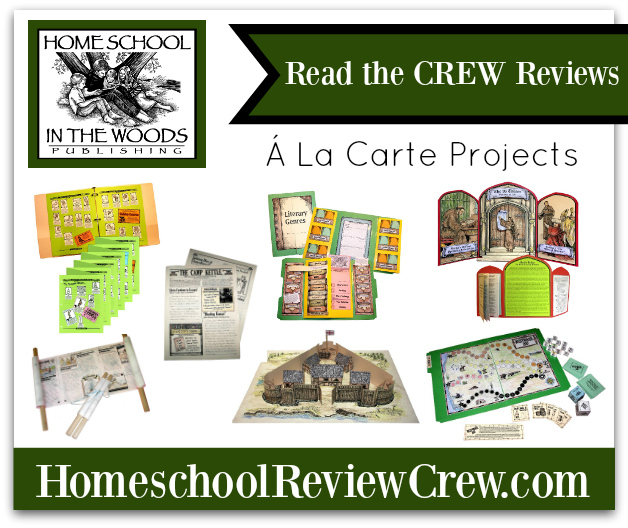 Members of the Homeschool Review Crew have been using a variety of the Á La Carte options (available as PDF downloads) offered by Home School in the Woods. 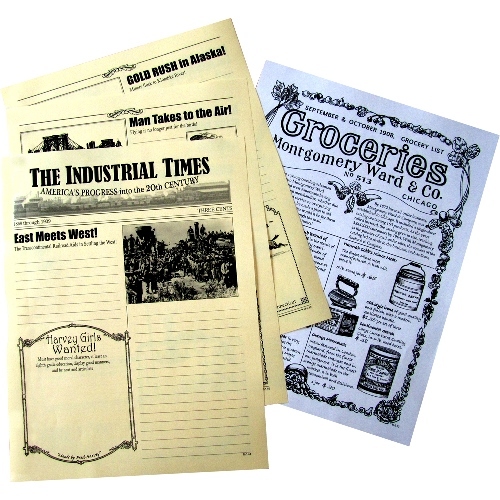 The Á La Carte products (available as digital PDF downloads) from Home School in the Woods are available in a wide variety of categories, separated by both time frame (from Ancient History and Bible times all the way through to 21st century America) and type of product (game, newspaper, lapbook, and more). On the website, you can narrow down what you want to study with your kids by either of those categories. Let’s take a quick look at each category. Timelines are a really great way to help your kids see when certain events happened in relation to other events. Choose just what you need, whether you’re studying a specific time period (Ancient Greece or The War Between the States, for example) or a wider subject (composers or scientists). 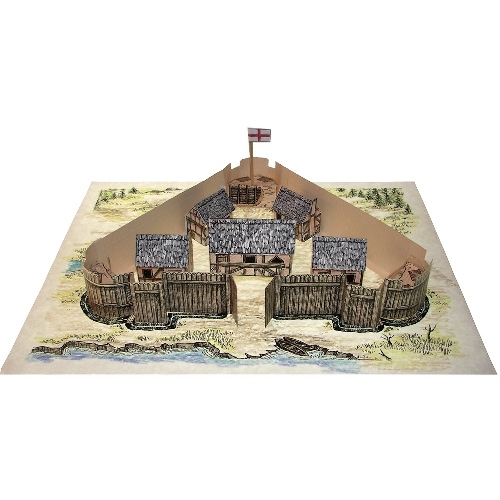 File Folder Projects are a hands-on product where your children create a visual representation of a certain aspect of history. Available options include The Orchestra and Martin Luther’s 95 Theses. 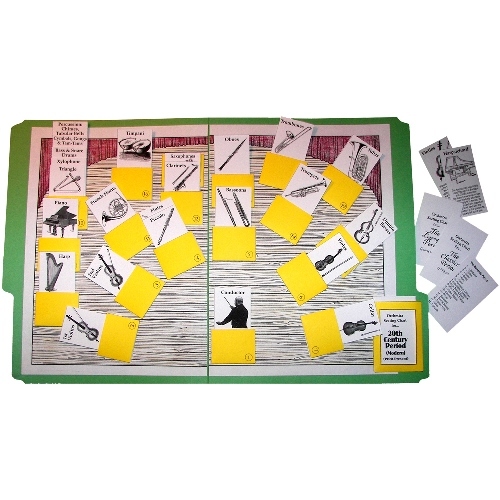 File Folder Games are just what they sound like: print out the PDF and attach the main portion to a file folder to create the board. 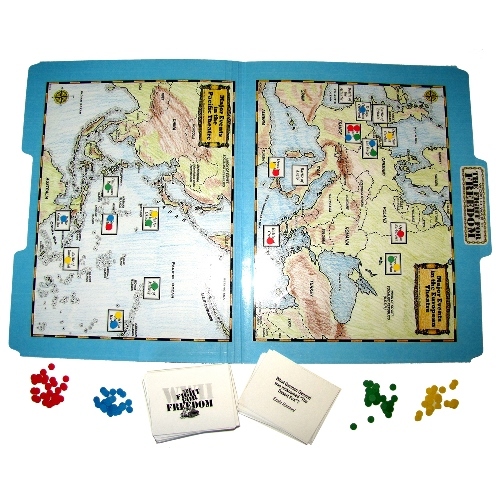 Using the included pieces, follow the instructions to play the game and learn a lot of history at the same time! Do you like the idea of playing a game, but your kids aren’t really into traditional board games? Try one of the regular Games instead. These include, but are not limited to, printable card games. Are Lapbooks something you and your children enjoy? There are two of these available: The Erie Canal Lapbook Project and Literary Genres Lapbook Mini Study. Newspapers are a way to combine creative writing with historical research, making a good project for older students. Each newspaper project includes several pages for you to print out and includes a variety of headlines based on the topic of the paper. Students learn about the topic of each headline and write their own article. There are even spots for kids to create their own era-appropriate ads and classifieds. If your kids want something a bit taller, try one of the 3-D projects. 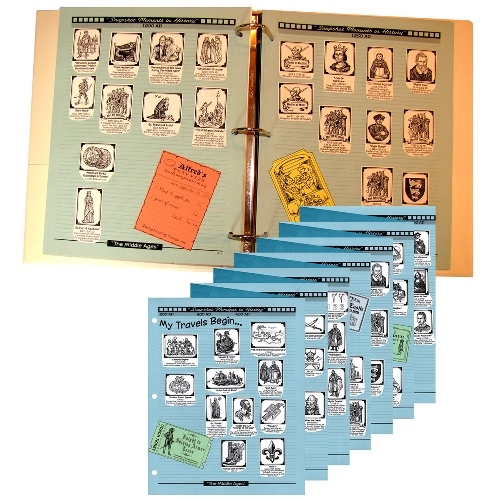 These are used to create models or art that won’t fit into a standard binder! 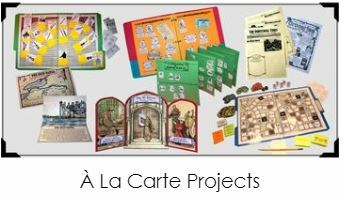 The Á La Carte products from Home School in the Woods are available for children of all ages, from K-12, so you’re sure to find something that will work in your homeschool! A big thank you to Wendy R @ Ladybug Daydreams for writing this introductory post.